In the last decade, due to factors of ICT infrastructural and broadband maturation, rising levels of educational attainment and computer literacy, and diversification strategies, e-learning has exploded in the Middle East and North Africa (MENA) region. 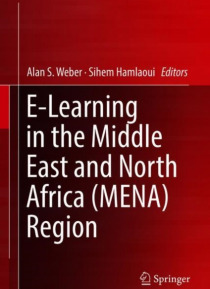 However, significant barriers remain in the region's e-learning development: lack of research on outcomes and effectiveness, paucity of Arabic lan… guage learning objects, monopolies and high cost of telecommunications, cultural taboos, accreditation, censorship, and teacher training.This unique volume is the first comprehensive effort to describe the history, development, and current state of e-learning in each of the 20 MENA countries from Algeria to Yemen. Each entry is expertly written by a specialist who is acutely familiar with the state of e-learning in their respective country, and concludes with a bibliography of key reports, peer-reviewed books and articles, and web resources.E-Learning in the Middle East and North Africa (MENA) proves itself as a vital compendium for a wide readership that includes academics and students, transnational program directors, international education experts, MENA government departments, commercial vendors and investors, and ICT development and regulatory agencies involved in e-learning in the Middle East.